Bookings for Dog Sledding and Winter Camping on the King's Trail are now also open for the winter 2020 season. Driving your own dogsled team is a very special experience. Winter camping adds an extra expedition feel and sense of adventure to any winter activity. Put these two together, and locate them in one of Europe's most stunning mountain areas along Sweden's best-known long-distance trail, the King's Trail ("Kungsleden") in Swedish Lapland, and you have a very special dogsled holiday indeed, challenging yet suitable for adults with a good level of fitness and a yearning to answer the call of the wild. As a winter camping tour, the itinerary and route taken is variable depending on weather and snow conditions. 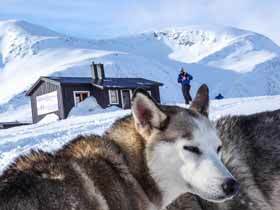 You may begin your tour from the kennels, sledding towards Torneträsk for the first days of the tour through a beautiful landscape of frozen lakes, rivers and forest before reaching Abisko and heading onto the King's Trail and into the mountains. Alternatively, you may begin sledding from Abisko (or from Nikkaluokta, taking the mountain route in the opposite direction) directly into the mountains. 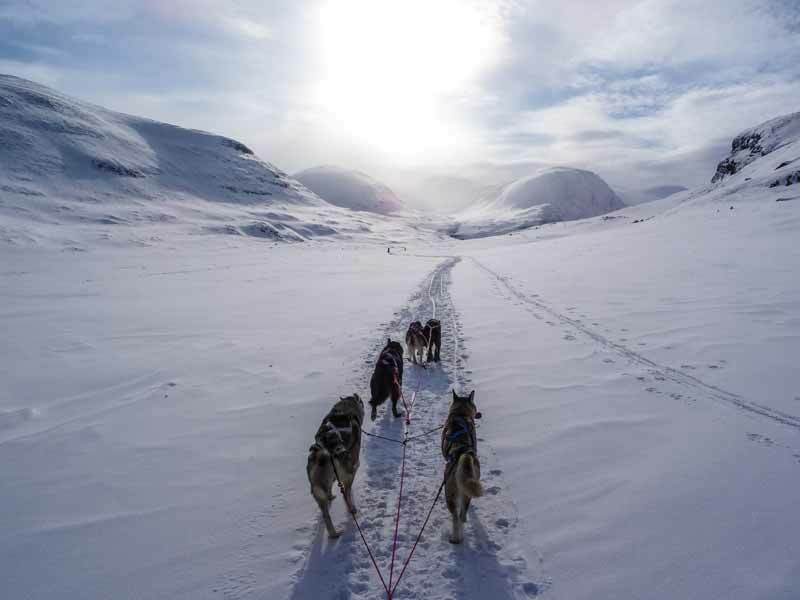 The King's Trail offers a spectacular setting for a dogsled adventure. Photo: James Padolsey. You will be driving your own team of Siberian Huskies, normally with the end point at Nikkaluokta, near the mighty Kebnekaise, Sweden's highest mountain. You will carry with you 2-person tents for overnight accommodation and, if conditions are suitable, a "lavvu" (tipi) for the group which you will set up each night for eating and socialising. When sledding along the King's Trail, the intention is to pitch camp on some nights near the mountain cabins spaced along the trail, which gives you the opportunity to take wood-fired sauna in the evening and to make use of some of the facilities at the cabins. If weather conditions make it necessary, these cabins also serve as a reserve option for overnight accommodation. There is a lot of work to do when making camp for the night! Not only do the dogs need to be cared for, but walls of snow will normally need to be dug around the tents and often also a large hole in the snow, which provides shelter from the wind while cooking and spending time at camp. The addition of winter camping brings an extra dimension to the tour. Photo: James Padolsey. 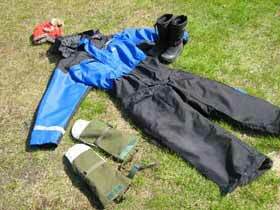 Full specialist winter clothing and camping equipment is provided, including thermal sleeping bag. The dogs and equipment are fully suited to winter conditions in the mountains, and while the tour is adventurous and challenging, you should also find that you sleep well and feel comfortable. Even if you decide to crawl into your sleeping bag early after the day's mushing, you can keep an eye out for the Northern Lights blazing across the night sky from your tent! Just 15 minutes from the kennels lies the world-famous Ice Hotel in Jukkasjärvi, making an Ice Hotel visit a popular option to arrange on your arrival or departure day (entrance charge payable locally). Transfers from/to the Ice Hotel on arrival/departure days can be offered as an alternative to transfers from/to Kiruna. On this tour you will be travelling far away from sources of light pollution, offering very good possibilities to see the Northern Lights. Displays are typically visible until around early April. Snowmobile tours (daytime or evening) are available to add as optional extra activities on your arrival/departure days. If you would like extra activities on your arrival or departure days, Reindeer Encounter and Sámi Experience in Lpaland is just nearby. Snowmobile activities are also available to add as optional extras in connection with the start/end of your dogsled tour - see under "Dates and Prices" for details. NB: Please note that the below is an example itinerary and may vary in a number of ways due to factors such as weather conditions, access to trails, seasonal changes and local reindeer herding activities. For example, if weather conditions are unsuitable for crossing the Tjäkta pass, alternative routes are available via Vistasdalen or Hukejaure. Cabin accommodation may be used on some nights during the tour as an alternative to camping if weather conditions make this necessary. Daily distances are typically around 20-45km depending on the terrain for the day's sledding. Arrival and transfer from Kiruna airport or train station (time flexible depending on travel arrangements). You will be taken to the kennels for outfitting with specialist winter clothing and sleeping bag. Accommodation is in cabin either at the kennel or a wilderness camp nearby. Dinner together and prepare for the tour ahead. There are no specific activities for this arrival day, but snowshoes are available to borrow for self-guided tours in the surrounding forest. Breakfast and care of the dogs, followed by introduction to harnessing your teams and handling the sleds and equipment. Each participant will drive own dog team with 5-6 Siberian Huskies. You then pack the sleds and begin your tour. 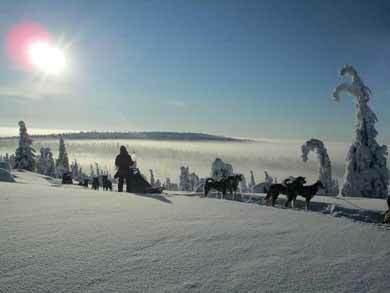 Today's stretch takes you towards Vieksalahti and provides an ideal chance to build your confidence as a musher. Accommodation this night is in cabins at wilderness camp. A relatively easy day's sledding on frozen lakes and rivers to Torneträsk. Your first night's winter camping, out on the ice of Lake Torneträsk. You will use the lavvu, which is heated with wood, for eating and socialising, but can also choose to sleep in the lavvu rather than tent if you prefer. You continue along Lake Torneträsk to reach Abisko, the start of the King's Trail. Overnight in tent. Today you begin an ascent into the mountains along the King's Trail, heading for the area around Alesjaure with its stunning natural setting. Some uphill sections where you will need to assist your team by running or "scooting" behind the sled. 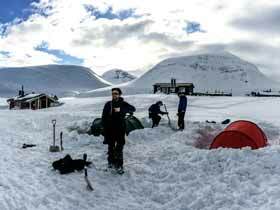 Overnight in tent with possibility to use the sauna facilities at Alesjaure - a wonderful way to ease tired mushing muscles! A hard day's climb over the highest point on the trail, the Tjäktja pass. Distance approx. 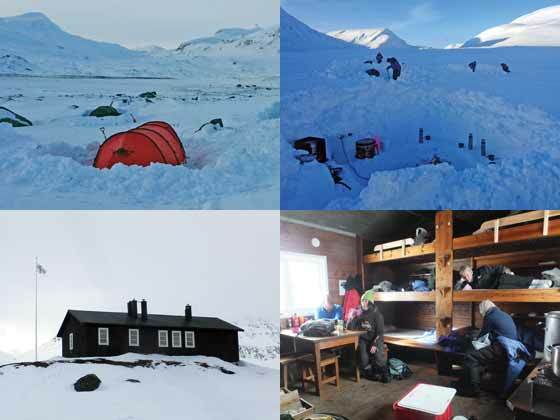 26-38km reaching either the cabins at Singi or Sälka depending on weather and trail conditions. Accommodation in tent. The cabins at Sälka have sauna facilities. You leave the mountain world and take your dogsled team through the valleys at the base of Kebnekaise, Sweden's highest mountain, to the end point at Nikkaluokta, a distance of 35-45km (depending on whether you reached Sälka or Singi the day before), where you will be met for transfer with your team back to the kennels. Accommodation in cabin as per Day 1 and a chance to reflect on your adventure, swap photos and share memories of your husky expedition! Breakfast and departure transfer. You may wish to visit the nearby Ice Hotel (see under "Transfers" below) before travelling to Kiruna airport or train station. *The Northern Lights can be seen anytime from around September to early/mid April. While the "spring winter" in March and April has longer hours of daylight and shorter nights than the deep midwinter, on the other hand these months can also have a greater incidence of clear skies. Groups of minimum 6 can also book private tours on other dates at standard prices - smaller groups also possible. Max. group size for standard tours is 6 persons, but for private tours larger groups can be accommodated. Snowmobile tours: Can be added as an extra activity for your arrival or departure day in connection with the start/end of your dogsled tour. Daytime tours can be added on arrival or departure day. Evening tours can be added only on arrival day. Solo travellers must choose drive own snowmobile option. Duration given is approx. total tour duration including initial instruction and breaks: 2.5 hour tours include snack/coffee, 3.5-4 hour tours include lunch (daytime) or dinner (evening). Evening tours give good possibilities to see Northern Lights if conditions are suitable. Min. age 10 years. Min. age to drive own snowmobile 18 years. Participants wishing to drive must hold full driving licence and be able to show licence locally. Morning tours typically begin with pick-up at 10.00. Evening tours typically begin with pick-up at 18.00 (up to 25th March) or 20.00 (from 26th March onwards). NB: Note that due to the nature of the tour, accommodation used along the route may vary, with cabin accommodation an alternative to camping if required by weather conditions. Three nights in cabins on Day 1, Day 2 and Day 7, four nights winter camping along the route in 2-person tents, normally with communal tipi depending on conditions. Sauna is available on one or more nights when camping near the cabins along the King's Trail. Accommodation for the first/last night is normally in simple one-room cabins at the kennels, which have four bunk beds and electricity/electric radiator. There is a communal hut for meals/socialising. Dry outside toilets. Standard of accommodation along the trail is simple (no running water or electricity). The tipi (when used) is heated by wood-burning stove. Water is drawn from nearby rivers and lakes. Everyone assists with tasks such as caring for the dog teams, pitching/breaking camp, chopping wood, fetching water and washing/tidying up. Sleeping accommodation on all nights during the tour is shared. Cabins will typically have one or two sleeping rooms, each with bunk beds. Camping and example cabin accommodation (where used) along the route. All necessary equipment during dog sledding tour including sleds with own dogsled team. 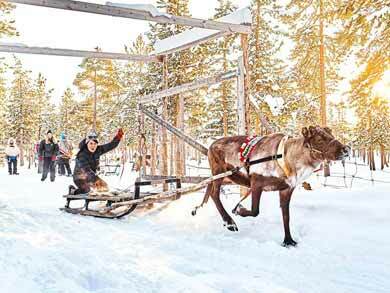 Each participant drives their own sled with four Siberian Huskies. Warm winter clothing for all activities: snowscooter overalls, winter boots, hat, gloves, inner and outer socks. Sleeping bag, sleeping sheet and pillow case, foam sleeping mat (reindeer skins are also used in the tipi for extra insulation). Tent (shared per two persons). Lavvu (tipi) for common use for eating, socialising, etc (weather conditions permitting). Thermos for hot water (there is no need to bring a separate water bottle). Return transfer between Kiruna airport or Kiruna station (or from accommodation locally) and the cabins in connection with your tour. For guests, wishing to visit the Ice Hotel on arrival or departure day, pick-up from the Ice Hotel on arrival day or drop-off on departure can be offered as an alternative (guests will then travel independently between Kiruna and the Ice Hotel). Local transfers to/from start/end point for activities during the experience as required. Dog Sledding and Winter Camping is a challenging experience. You should have a good level of fitness and enjoy the outdoors. You should also be comfortable living in close proximity with others. Minimum age 18. No previous dog sledding experience is required. 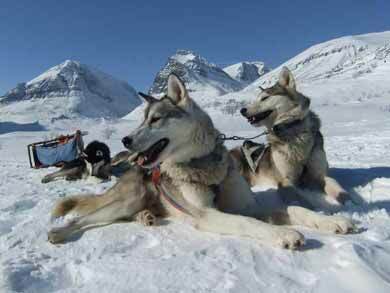 Dog sledding can be physically demanding, especially in the mountains. You must be able to brake the sled when going downhill, which can be hard when you are working against gravity and the pull of four Siberian Huskies, and also assist the dogs during uphill sections by stepping off and running behind the sled. 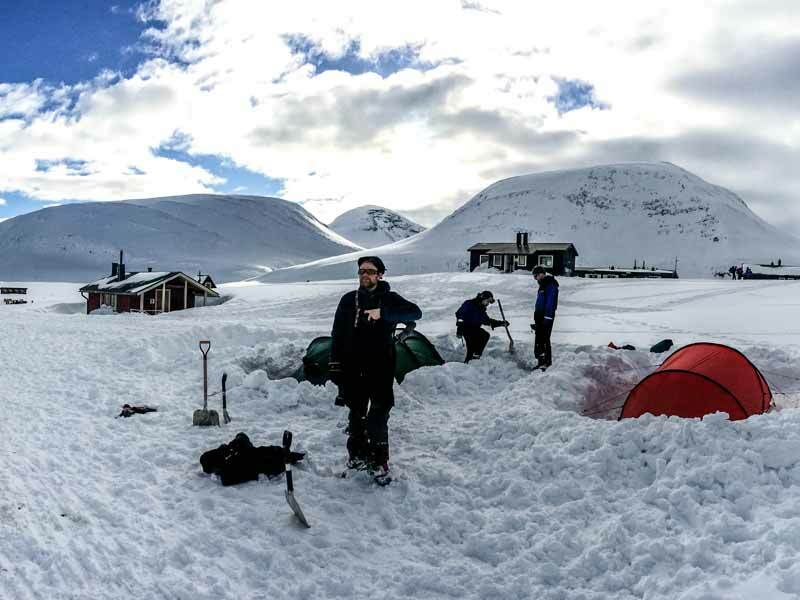 Tasks around the camp (building snow walls, etc) can also be physically demanding and the element of winter camping will add to the challenge level compared to a tour with cabin accommodation. The tour takes place in a remote mountain landscape where weather and trail conditions can be changeable. You may need to work hard to assist your teams when going uphill, especially in deep snow. The experience of winter camping adds considerably to the overall level of challenge and setting up camp takes time and energy. A total of minimum two persons is required for scheduled tours to run. You are of course welcome to book as a solo traveller. Maximum group size 6 persons for scheduled tours. There may also be other persons staying at the overnight accommodation used during the tour. This provider has a detailed environmental policy and has received Swedish Tour Quality certification. This experience is located in the far north of Sweden, one of the world's best locations for seeing the Northern Lights, and offers good chances to see a display during your tour. Wonderful displays are regularly seen on the tours. However, it is important to bear in mind that the Aurora is a natural phenomenon and sightings can never be guaranteed in any location - it is not possible to search for a display. The skies may be cloudy, there may be no activity, or you may be fast asleep after a day of adventure on the trail! Fly to Stockholm then onward to Kiruna by night train or domestic flight connection. Transfer from Kiruna airport or train station is included. 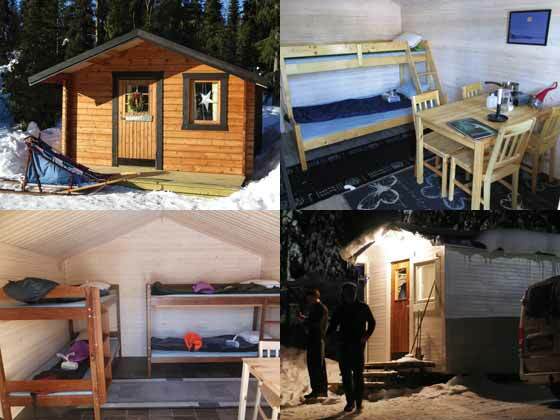 Husky Mountain Expedition in Lapland is the cabin version of this tour.